This panel examines several case studies from a Burkean perspective in order to explore how rhetorical framing can act to undermine the ability to negotiate and persuade. This panel features competitively chosen papers submitted to the Kenneth Burke Interest Group. The salience of Burkean approaches and terms is evident in ongoing applications across disciplinary, philosophical, and socio-political boundaries. What are the historic roots of Burke's own biases and how do we read him today? Whatever the genre or mediaextension, his rhetorical frame seems to “make a difference” that matters. The significance of the difference is illuminated through his philosophical lineage and illustrated in three types of rhetoric that show us ourselves: the rhetoric of ecology, of satire, and of the graphic novel. The panelists will endeavor to demonstrate the applicability of Kenneth Burke to the Philosophy of Communication, an area of the disciple to which Burke is not normally supposed to be relevant. Each of the participants in this session will bring Kenneth Burke into conversation with an important philosopher or issue in the philosophy of communication. 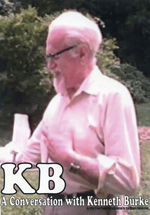 And on Friday (3.20) at 9:30-10:45, the KENNETH BURKE BUSINESS MEETING convenes.